Gears Of War and I go way back in my gaming history, with Gears being the first Xbox 360 shooter that I found myself investing a stupid amount of time in when it comes to the multiplayer. I'm not alone here either, as Gears now has a massive fanbase. All of whom love it for their own reasons, be that the characters, the multiplayer, or the story that goes on between the game, books, and soon to be movie that was announced at a launch event for the game recently. While Halo was the series that brought many to pick up an Xbox console, I think Gears Of War was the one that sold a bunch of 360 consoles, with word of mouth soon spreading that not only was this game gorgeous to look at, but Epic had brought something a little different to the genre that we were all getting a little bored with now. I tried my best to ignore any sort of trailers and things going into the launch of GOW 4, as if the past has taught me anything it's that hype can kill a game almost instantly. We've all done it in the past, a game hasn't lived up to what we built it up in our own mind, so a game that we would normally enjoy is ruined by us putting it on a pedestal before we've even got on our hands on it. For me, the original Gears is still the best one in the series and always will be. But I was still excited that Gears was coming to a new console, and with that, it would be that time again to whip out the old Gnasher and Lancer and get that adrenalin rush that only Gears can give me. The campaign was a weird one for me in all honesty, starting out a rather dull and slow affair, but the longer it went on the better it got. Maybe it was paced this way so new players to the series could get to grips with how Gears works, who knows. For the returning player, however, the first act can start to overstay it's welcome when you're about the third level in, with nothing exciting going on until around Act II for me. 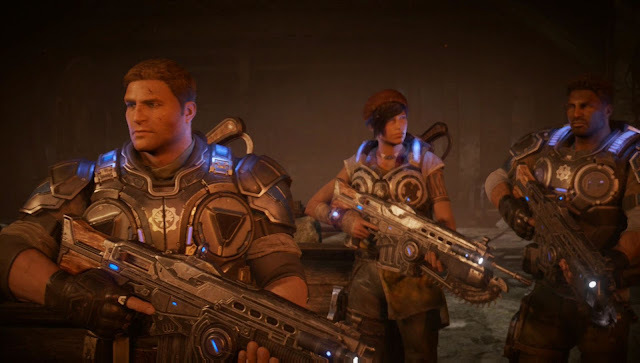 The campaign sees you taking control of J.D fenix, son to GOW legend Marcus Fenix, and of course brought into this world by his Mother, Anya Stroud. Not really one who likes to dig that deep into a story when typing up a review on a game that people plan on buying, let's just say that mysterious deaths lead to a new enemy which need you and this new team to fill them with bullets. The new team of yourself (J.D), Del, and Kait do a really good job of getting you to not only invest in them as you go through this campaign but also add to what is already a rollercoaster in terms of emotions and open-mouthed moments around every corner. If I had one disappointment it would be the ending is a little bit of an anti-climax if I'm honest, with it building up good to the game not really having that blockbuster finish. If you played the recent remaster of Gears on the Xbox One, then picture the levels that were in the PC version and added into the remaster and that's what the ending of GOW 4 feels like too. 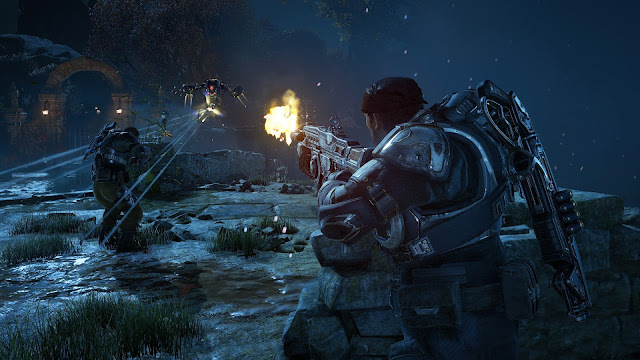 If you've played a Gears game before then the format that the levels play out like will be something you're very familiar with, with each level seeing you exploring a bit, only to then face a swarm of enemies that you must clear out to move on and progress. Obviously, over time the enemies change, and the campaign does a great job of mixing things up when it gets close to reaching that point of where change is needed in terms of who you're looking down your gun sights at. As I mentioned above mind, levels can at times overstay their welcome, as I did find myself hoping that some levels would end sooner that they did. This is only because in the earlier stages walking a bit to have a Condor (an aeroplane that drops off enemies in pods into combat) did seem to be just an easy way to drop them into the fold without any real explanation. A few levels will stick with me forever, but that's for the player to experience and enjoy rather than some idiot reviewer to spoil all the surprises. We also have a few new weapons to play with this time around, with classic weapons also returning and bringing that lovely head popping noise that we all love with them (love you longshot). The Embar (charge-shot, sniper rifle), Buzzkill (fires out circular saw discs that bounce off things such as floors and walls), and the bloody glorious Overkill (the best shotgun the world has ever seen) are just a few of the new toys that you will get to play with. Of course, you getting to play with them also means your enemies can too, and putting a dropshot in the hands of one The Swarm can be deadly let me tell you. 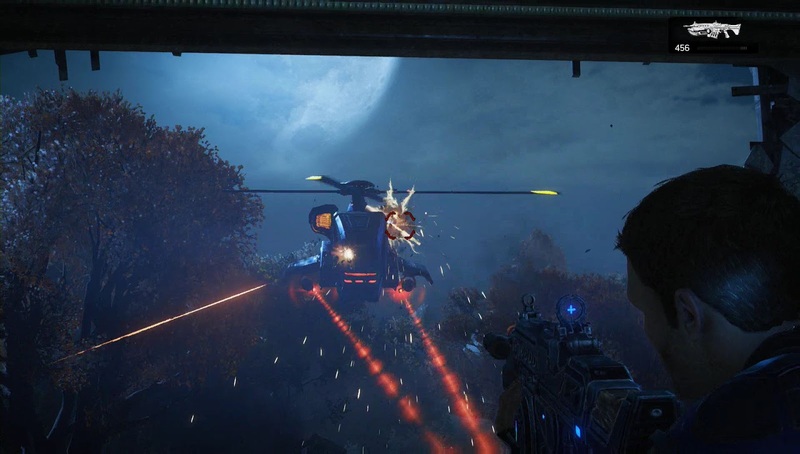 The campaign is also available to play with a friend in co-op with the AI taking control of the rest of the team. You do have moments where splitting up takes place once again, and with me playing through my campaign with just AI there were times when they did let me down a little when it come to backup. Nothing to the point of making me rage at them, but certainly if you can play with an actual person (on higher difficulty levels) I would urge you to do this). In terms of replay value you have a few reasons to return back to the campaign once finishing it, as collectables again return with them hidden over all of the acts. Every GOW game I tend to take the same stance with them when playing through the campaign. My first playthrough would see me sticking it on normal and enjoying the story and action, followed quickly by a second playthrough with a friend where you mop up all these collectables up in one swoop, with an added challenge if you want by sticking it on insane. Decent new characters, brand new weapons, rollercoaster story, the only downside is it takes a while to get going. This all said, Gears 4 campaign gets a bloody and chainsawed big thumbs up from me. While many will be picking up Gears 4 to see what the campaign has to offer this time around, online is where most will end up spending most of their time. 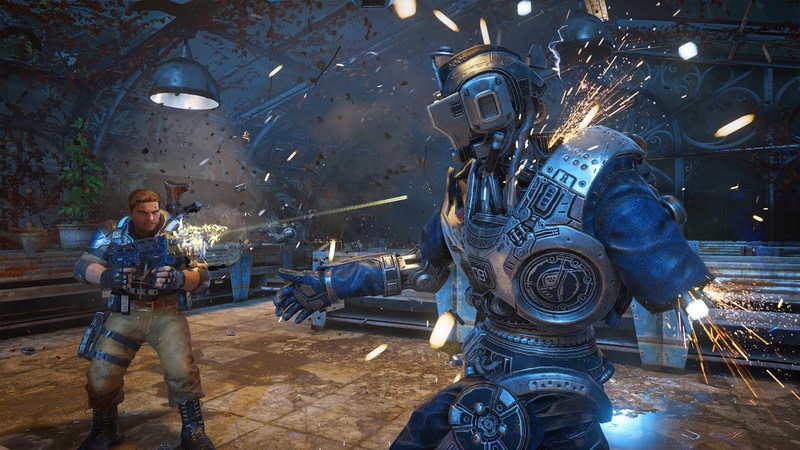 At the start of this review I did say that the online portion of the original Gears for me was the place I had most fun, with 2, 3, and even Judgement (Judgment if you want to spell in wrong/the American way) just lacking that pull back factor for me personally. 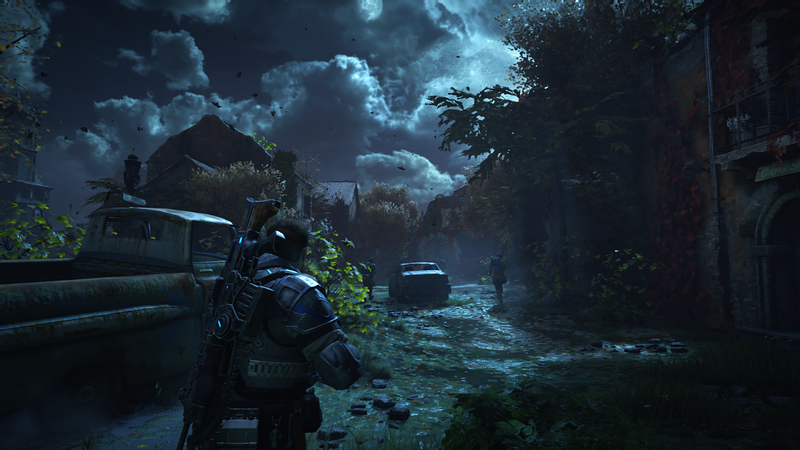 Playing the recent beta that Gears 4 had we all knew that it had a great shot at being great again, but does it offer something for everyone? 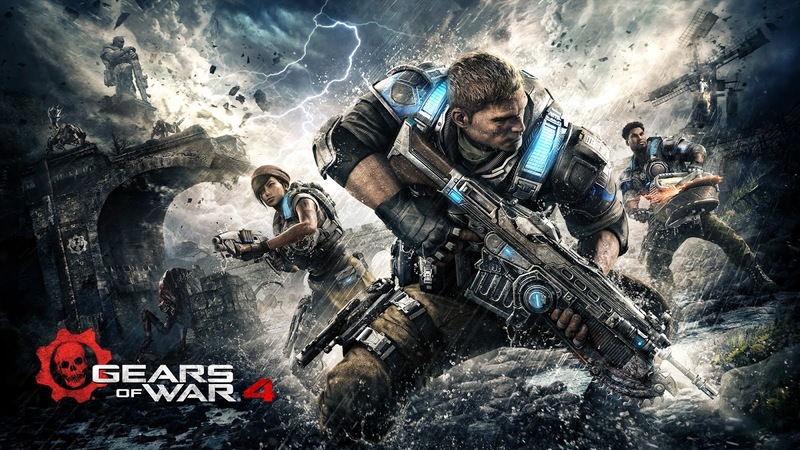 Not only does GOW 4 offer up a decent mix of new and old online modes to choose from, but it also makes those modes accessible to every sort of player, be those players who go weak at the knees when thinking about taking Gears online, or those who class themselves as a pro when wrapping their hands around a Gnasher. 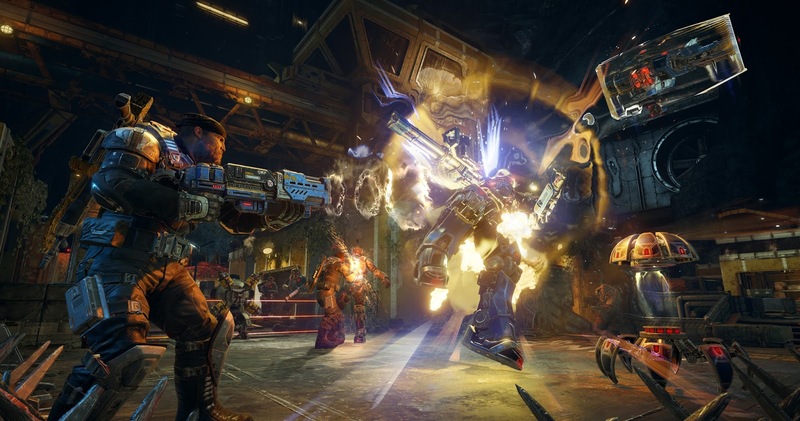 If taking Gears online was not your thing previously mind you, then Gow 4 still won't really be for you if you found yourself hating Gnasher shotgun battles when playing the more skilled players online. 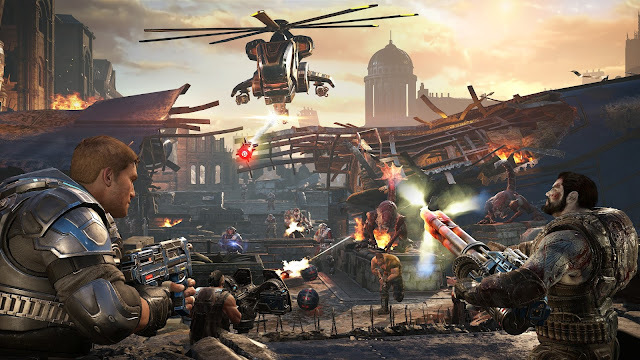 The Gnasher is very much still the goto gun when it comes to battling it out online with real people, but playing bots is worth looking at if you want to at least try to enjoy the online side of the game this time around. The modes available all offer a decent mix, with the game offering up such modes as Team Deathmatch, Dodgeball, Guardian, Warzone, King of the Hill, and Arms race. TDM, King of the Hill, Guardian & Warzone are modes most of us will of played previously in other games, with Dodgeball (5v5 match in which you only have one life, with the only way to respawn back in being when a teammate takes out one of the other team and you're next in the respawn queue), and Arms Race (much like a game of gun game on COD, as each team will need to score three kills with the weapon they are given to move onto the next gun. Do this with all guns before the other team and you win the round) being something new and interesting added to the game. Other modes that you can play can be found in the Competitive mode section, which offers both Escalation and Execution for you to play. Just below that, you can find the fantastic co-op section, where you can team up with others against bots, making it a great place to start if you want to get better at the game. Then, of course, we have Horde 3.0, or as I like to call it "the eater of time", as before you know it you're an hour in on wave 20, knee deep in blood, robot pieces, and body parts. Get the right team and this can be a jolly little time, but when you have teammates who are in for themselves it can become a little annoying. This time around you can drop defences wherever you see fit, with the option to play on any difficulty ranging from casual to insane, with even casual offering a decent challenge when reaching the higher wave numbers. Choosing from one of five classes (Soldier, Sniper, Scout, Heavy and Engineer), you get to try your best to stay alive over 50 waves of enemies who grow stronger and at times even bigger than the previous wave. You start the game by choosing a nice location to drop your Fabricator, which is the place you will go to drop off any credits you have gained by killing enemies, which will then allow you to spend them on weapons and defences, helping you to hopefully reach wave 50. Like I said above, it can be ruined by selfish idiots, but get a team and the right wavelength and it can be something special. The seedy world of microtransactions can be something that many look down upon in gaming world, but we also seem to forget that it's all about choice. You're in no way forced to open up that digital wallet of yours to buy these card packs which include things such as Personalization Character skins, weapon skins, emblems, XP and Credit Boosts for both Horde and Versus, and Class-based skills and abilities that can be used in Horde, but if want to unlock some via packs bought with real money, then you can. These packs can also be bought with in-game credits that you can earn by playing the game a bunch too, Sure it may take a little longer to buy those more expensive packs, but like I say, the option to ignore it completely is there. In regards to class skills, having duplicate cards for one particular thing will allow you to upgrade that skill too. So say you have a level 1 card that gives you 20% headshot damage, use a duplicate card to upgrade it to level 2 and that will increase to 40% damage when taking on the horde. It makes for a decent little side thing to do away from everything else. Overall: I already told you I loved the single player, well apart from it taking it a little bit too long to get going and then the ending having a bit of a rushed feel to it. Other than that, it was a well-told story and easily the best looking Gears game to date. As for the multiplayer. Well, not since the first Gears game have I found myself constantly wanting to load up a multiplayer at any chance that I've got. Unless you can't stand gnasher battles, then I would find it hard to believe that you could come out after an hour or two of playing online not saying that Gears 4 doesn't tick all the right boxes. It has something for everybody.